The Porter Scholarship program is the largest scholarship organization at the University of Louisville. Named after a former university trustee, the late Woodford R. Porter Sr., the scholarship program was created in 1984. The mission and purpose are to provide academic, personal and professional support and to all recipients of this scholarship. Areas of support are based on the four pillars of promise which include scholarship, leadership, service and heritage. 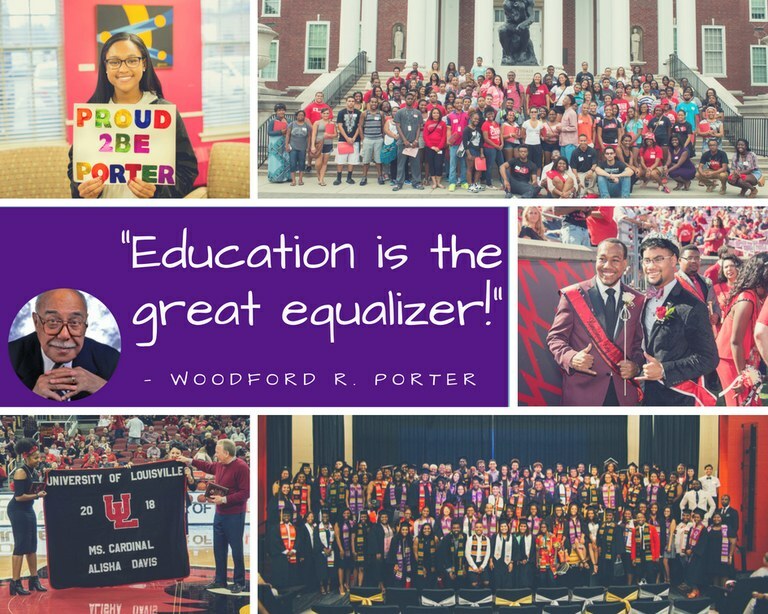 The Woodford R. Porter Scholarship Program is the largest African American scholarship organization at the University of Louisville. Through its foundational four pillars, the program provides academic and personal/professional developmental support to Porter Scholarship recipients. It promotes interaction, enhances leadership opportunities, and encourages professional and/or graduate education for outstanding student residents of Kentucky. Each academic year is devoted to the continued development of programs and services offered to our 500+ porter scholar membership organization. More importantly, the program is charged to not only support students as they matriculate but to also educate them in unique and creative ways that supplement their overall undergraduate experience at the University of Louisville. It is from this vision and perspective that our administrative team, advisory committees, campus supporters and community partners welcome our new fundamental and powerful concept toward this effort entitled “BUILT 2 GRADUATE” aka B2G. The new student success model has been designed to provide each scholar with an opportunity to participate and become connected to programs and services that assist them at their appropriate level of classification (FR, SO, JR, SR) and comprised of themes and special focus areas. As part of the B2G model students participate in the Porter Retention Program which includes a per-determined number of check-in meetings with their scholarship advisor throughout each semester. Since the 2015-16 academic year Porter Scholars have utilized REACH support services more than 4000 hours on more than 3500 occasions each academic year; more than 52% of Porter Scholars have also actively participated in the retention program. The Society Porter Scholars is the largest African American student organization at the University of Louisville. The society’s mission is to work for its members to encourage the maintenance of high academic standards, enhance leadership development, work diligently to provide services for the community and cultivate understanding for the heritage of its scholarship recipients while having a focus on the retention and graduation of its membership. The University Student Academic Rights and Responsibilities may be found by following this link:Student Rights and Procedures.